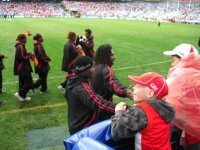 In this article we look at the remaining countries that have begun playing Australian Rules football. We've previously reviewed the regions of North America, Europe, Africa, Oceania and Asia. Here we'll see the beginnings of the game in the Middle East and South America. First we go to Lebanon, where Aussie Rules has a small toe-hold. As in some other countries, it faces the problem of locals not distinguishing it from Rugby League, which has also tried to get started there. A reasonable esimate might be 3 senior teams, 45 players, no juniors, but details are sketchy. Israel has had several attempts to get the game going. It has been difficult for organisers to get stable numbers, with a lot of Aussies passing through and playing then leaving again. Since the mid 1990s matches have been played in Tel Aviv, and currently around 70 players are listed on the books, but it seems regular numbers are around 20 players, splitting between 2 sides for games. In South America, two nations have tentatively begun Aussie Rules programs. In Argentina, there have long been reports of a small league, with perhaps four sides. There has also been junior development work, with a tournament held in 2004 for boys under 16s, 14s and 12s, and girls under 16s. The senior sides are Aguilas (South zone), Bombers (Capital), Bulldogs (West zone) and Demonios (North zone). There may also be an under 19s league. Unfortunately information from the region is scarce and a lot of good work may be going unrecognised. Trying to put all these numbers together gives 4 senior teams, about 60 adults fitting the 4 game criteria, and around 120 juniors. In Chile, the game has just been introduced, with plans in 2004 for two teams playing 10 per side. Again, information is scarce, but giving the benefit of the doubt, we estimate 2 senior teams, 20 adults, 0 juniors. There have been unconfirmed reports of an amateur footy association being set up in India. Whether this is active in developing Australian Rules football is unknown. Obviously with cricket ovals, a massive population, an affinity for Australia through cricket, and a relatively lower interest in soccer, the region has huge potential for the game. Let's hope when we one day do a follow-up census that India will figure prominently. This completes are census of all the Australian Rules playing countries outside of Australia. Of course, it is possible some may have slipped through our net, but if so, it would seem unlikely they would be playing in any significant numbers. Next in this series will be a look at the Australian figures. They dwarf those of other countries, but it is important to examine them to gauge where the game is internationally. After that, we will present a complete summary of all nations.